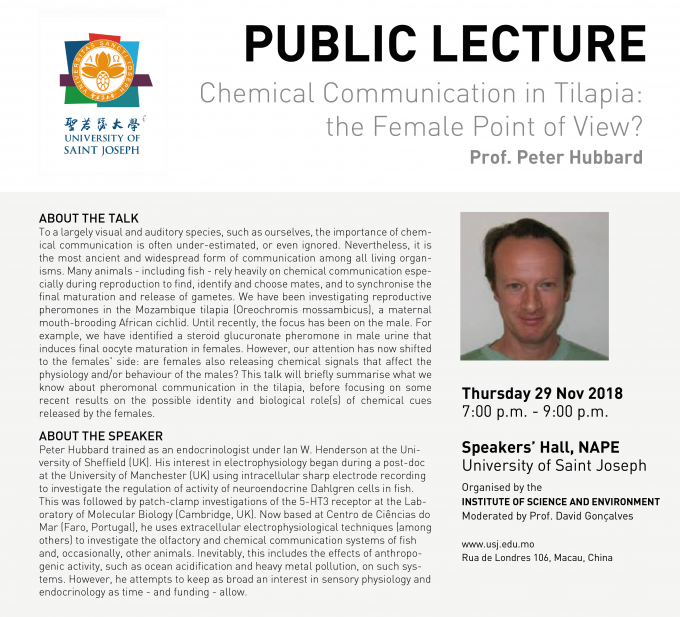 Public Lecture: Chemical Communication in Tilapia: the Female Point of View? To a largely visual and auditory species, such as ourselves, the importance of chemical communication is often under-estimated, or even ignored. Nevertheless, it is the most ancient and widespread form of communication among all living organisms. Many animals – including fish – rely heavily on chemical communication especially during reproduction to find, identify and choose mates, and to synchronise the final maturation and release of gametes. We have been investigating reproductive pheromones in the Mozambique tilapia (Oreochromis mossambicus), a maternal mouth-brooding African cichlid. Until recently, the focus has been on the male. For example, we have identified a steroid glucuronate pheromone in male urine that induces final oocyte maturation in females. However, our attention has now shifted to the females’ side: are females also releasing chemical signals that affect the physiology and/or behaviour of the males? This talk will briefly summarise what we know about pheromonal communication in the tilapia, before focusing on some recent results on the possible identity and biological role(s) of chemical cues released by the females. Peter Hubbard trained as an endocrinologist under Ian W. Henderson at the University of Sheffield (UK). His interest in electrophysiology began during a post-doc at the University of Manchester (UK) using intracellular sharp electrode recording to investigate the regulation of activity of neuroendocrine Dahlgren cells in fish. This was followed by patch-clamp investigations of the 5-HT3 receptor at the Laboratory of Molecular Biology (Cambridge, UK). Now based at Centro de Ciências do Mar (Faro, Portugal), he uses extracellular electrophysiological techniques (among others) to investigate the olfactory and chemical communication systems of fish and, occasionally, other animals. Inevitably, this includes the effects of anthropogenic activity, such as ocean acidification and heavy metal pollution, on such systems. However, he attempts to keep as broad an interest in sensory physiology and endocrinology as time – and funding – allow.